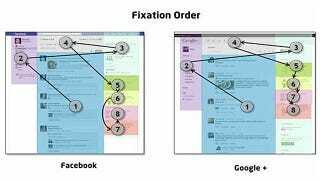 An eye tracking study of 54 users under the age of 34 shows that Facebook users and Google+ users read their homepage in the same way. Both Facebook and Google+ users begin by examining the main column where all the content is located. They then jump around from the left, right and top columns as they scan the less important parts of the page. The amount of time spent reading each section is almost identical between the two social networks as well.